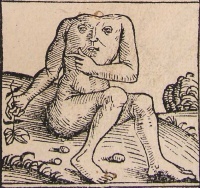 The Blemmyes (Latin Blemmyae) was a tribe which became fictionalized as a race of creatures believed to be acephalous (headless) monsters who had eyes and mouths on their chest. Pliny the Elder writes of them that Blemmyes traduntur capita abesse, ore et oculis pectore adfixis ("It is said that the Blemmyes have no heads, and that their mouth and eyes are put in their chests"). The Blemmyes were said to live in Africa, in Nubia, Kush, or Ethiopia, generally south of Egypt. Some authors derive the story of the Blemmyes from this, that their heads were hid between their shoulders, by hoisting those up to an extravagant height. Samuel Bochart derives the word Blemmyes from two Hebrew terms, one a negation, the other meaning "brain", implying that the Blemmyes were people without brains. To the west of Caroli are divers nations of Cannibals, and of those Ewaipanoma without heads. ---Sir Walter Raleigh, The Discovery of Guiana. And of the Cannibals that each other eat, The Anthropophagi, and men whose heads Do grow beneath their shoulders. ---Shakespeare, Othello (circa 1603). In Umberto Eco's Baudolino, the protagonist meets Blemmyes along with Sciapods and a number of monsters from the medieval bestiary in his quest to find Prester John. In his 2006 book La Torre della Solitudine, Valerio Massimo Manfredi features the Blemmyes as fierce, sand-dwelling creatures located in the southeastern Sahara, and suggests that they are the manifestation of the evil face of mankind. Othello makes reference to them as "men whose heads | Do grow beneath their shoulders" [I.iii.143-144]. Science fiction author Bruce Sterling wrote a short story entitled "The Blemmye's Stratagem", included in his collection "Visionary in Residence". The story describes a Blemmye during the Crusades, who turns out to be an extraterrestrial. Gene Wolfe writes of a man with his face on his chest, located in his short story collection Endangered Species. Blemmyes appear in the 2000 novel The Amazing Voyage of Azzam by K Godel as cannibalistic tribesmen who guard a lost treasure of King Solomon. They use clubs, spears, and blow darts as weapons. Ancient writers sometimes used the term anthropophagi (Grk: man eaters) to describe the Blemmyes, as they were known for their cannibalistic proclivities. Garry Kilworth's story "Out Back" features a Blemmyae. Unless indicated otherwise, the text in this article is either based on Wikipedia article "Blemmyes (legendary creatures)" or another language Wikipedia page thereof used under the terms of the GNU Free Documentation License; or on original research by Jahsonic and friends. See Art and Popular Culture's copyright notice. This page was last modified 20:34, 5 July 2013.